The first program of its kind, AMMP provides grants of up to $750,000 for implementation of non-digester dairy manure management strategies that reduce methane emissions. Specific eligible practices include composting, dry scrape, advanced solids separation, and conversion to or expansion of pasture-based systems. Projects must also demonstrate other air and water quality benefits. The California Department of Food and Agriculture (CDFA) administers the program. Methane comprises six percent of the total greenhouse gas (GHG) emissions generated in California. It is a very potent GHG with a global warming potential about 25 times that of carbon dioxide over a 100-year period. Agriculture is responsible for about 60 percent of California’s methane emissions, and the state’s dairies are the primary source of those emissions. Approximately equal levels of emissions come from dairy manure management systems and from the digestive process of enteric fermentation in dairy cattle rumens that generate methane exhaled by the animals. In 2016, Governor Brown signed legislation to require a 40 percent reduction in livestock methane emissions by 2030 (SB 1383). In 2017, AMMP was launched by the CDFA. 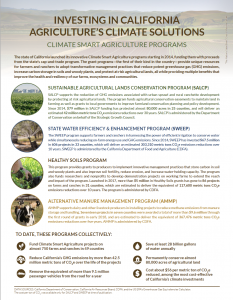 Find additional resources, including a CalCAN fact sheet on the program and more information from the CDFA, including application assistance opportunities for the current round.